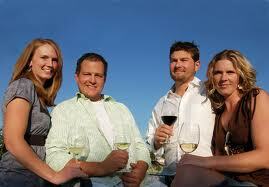 The Dusted Valley Vineyards website describes Wisconsin native Chad Johnson (the dude on the right) as “winegrower and owner.  The website you’re reading describes Chad as a smart, funny, personable guy who, with fellow Cheesehead Corey Braunel (left), produces delicious, vibrant wines under the Dusted Valley and Boomtown labels. When writing this Walla Walla travel guide, the ever-wise Chad opted not to cite individual wineries, lest he slight any companions; the links provide all the info you need on wineries to visit. I wouldn’t want to be growing grapes and crafting wine anywhere else in the world. Some people say it’s what Napa was 40 years ago. I do know this is an incredible little town smack dab in the middle of nowhere that delivers a laidback lifestyle rich in culture and drenched in killer wine and food. Getting there: There are three direct flights a day from Seattle to Walla Walla and several to Pasco, 50 minutes to the east. It’s a three-hour drive from Spokane, four hours from Portland, Ore., and 4½ from Seattle. Hotels: The Marcus Whitman Hotel offers luxurious accommodations and a prime location right downtown within walking distance of most restaurants and shops. Stay in the tower for the complete experience. “¦ Walla Walla Inns has two great locations, one in a vineyard and the other right in the middle of the historic downtown. “¦ Bed-and-breakfast fans should check out the Walla Walla B&B Association … For stretching out on the sofa and lounging in a more relaxed atmosphere, there are a lot of great vacation rentals via this site. Saffron Mediterranean Kitchen ““ Mediterranean cuisine from Moroccan to Greek to Spanish featured by a two-time James Beard Award nominee. I learn something about food every time I’m there. Trust the waiters; they will guide you through this incredible experience. T. Maccarone’s: Wonderful Italian from homemade pastas to the always fresh Pacific Northwest seafood. Whitehouse Crawford ““It’s the original fine-dining spot in Walla Walla and a classic. Housed in a historic plaining mill built in 1903; look at the wall-sized photo and count how many people are missing their fingers. Brasserie Four ““ Classic bistro; try the Croque Madame and Pomme Frites with Aioli. Green Spoon ““ You won’t be disappointed with the Turkish-style lamb burger. Wine bars plus some grub: Vintage Cellars has one of the best local bottle lists in the city. “¦ The Vineyard Lounge in the Marcus Whitman Hotel has bar and dinner menus. Dessert and Coffee: Colville St. Patisserie has great caffeinated beverages, and don’t forget to bring your sweet tooth. If you are into gelato, this is the place. *AK’s Kitchen ““ Fantastic street food. You will have to check them out on Facebook to find out where Andrae’s mobile kitchen is parked. *Olive Market Place and Cafe ““ This casual café has sandwiches, salads and the flatbread pizza is fantastic. *Graze ““ It has some of the best sandwiches around. If you’re hungry, try the Latronka. They cure the pastrami and sauerkraut in house. *Salumiere Cesario ““ Gourmet grocery. *Taco trucks ““ Everybody has their favorite, and you can’t go wrong. Play it safe and go with the Walla Walla taco smothered in grilled Walla Walla sweets or be adventurous and try the lengua or cabeza tacos. I ain’t gonna lie. It’s damn good with a little beer. Pho Sho ““ Inspired Vietnamese. At least once a week I need Pho Sho my fix. Southside: If you want to drive through vineyards and sit on patios with views of the pristine Blue Mountains, this is it. The Airport region houses many wineries in the old Army Air Corps Training base. Downtown: Shop for wine and clothes and have lunch, all without hopping in your car. West Side is home to some of the valley’s original players. For more info on all areas, go here. Farmers Market ““ Features farm-fresh local produce, delicious food, crafts and much more. Go Saturday morning; there are more vendors. Walk around the award-winning restored downtown. Monteillet Fromagerie — This farmstead artisanal cheese maker is crafting some incredible goat and sheep cheese. It stinks so good. Golf: Wine Valley Golf Club is listed as one of Golfweek’s Top 100 courses. … Veterans Memorial is a municipal course worth your time. For more go to Tourism Walla Walla.